AvrLogger logs Thermal- / Load- / Storage I/O- / Network I/O-Values from the DiskStation and visualizes it in the DSM. Created plots can be archived and / or copied to a user-defined directory. AvrLogger can be configured extensively. AvrLogger supports time scheduling: If Time scheduling is activated, the hibernating state of the DS will NOT be interrupted. - Fixed: On Single Bay NAS, an unbound variable caused AvrLogger to crash. - Improved detection of disks and disk groups in expansion units. - Storage I/O values of disks and disk groups in expansion units are now determined correctly. - The devices are now sorted in ascending order. "sda" is now called correctly "Disk" with a Number. separated by a hyphen. E.g. Disk 8 in Expansions Unit 1 will show "Disk 1-8"
- Disk arrays, e.g. "md2", are called "Pool" with a number that matches the DSM storage pool. "eth" is now called "LAN" with a Number. - The used unit can now be overlaid on the axes. - The general color for all legend entries can now be customized for each color scheme. Due to an incompatibility, it may be necessary after the update to re-adjust the general color. - Stability of detection of different sensors improved. - New: Icon implemented that indicates whether AvrLogger has been stopped via the package center. - New: The CronJob checks on every call if AvrLogger is still running and restart AvrLogger if necessary. - Importing and processing the database accelerates. - In "Avr-Config" the "Timeline profile 168 hours" is available again. select a different accuracy setting than "high & high/2" and decrease the number of Plot-Lines. - Behavior in case of an unexpected change of network devices or the storage pool improved. storage pool error and has been fixed, AvrLogger may need to be restarted manually to detect the changes. the top until the Plot has been updated. "Color-Scheme" disappears because the functions are then completely integrated in "Plot-Config". Incorrect values can cause AvrLogger to caught in an infinity loop or crash. When this happens, AvrLogger will restart after a 60-second timer-out and try to reset the last changes. If that does not work: "Stop" AvrLogger in the package center, change the value back and "Restart" AvrLogger." - New in "Avr-Config" : It can now be managed up to 5 different settings. - New in "Plot-Config": If "Expert Mode" is enabled in "Avr-Config", Layout presets can be loaded. - Archiving function was not executed due to a wrong parameter. - AvrLogger previously used up to 3 config files. These have now been combined into a single one. - In "Avr-Config" and "Plot-Config" the button and function "Load Default's" removed. - In "Avr-Config" the "Timeline profile 168 hours" has been removed. - Optimized reading of the database. Only the actually used sensor values are read in and calculated. - To ensure the correct Scheduling / Hibernation feature, AvrLogger will now set AvrLogger's "enabled"
Flag after AvrLogger has been upgraded and Scheduling / Hibernation was selected in AvrLogger. - It is no longer necessary to disable Scheduling / Hibernation before upgrading. - At the first call the current settings are displayed. - Color-Scheme must first be selected and loaded before they can be used. - Added entry for the current settings. - Added button with which the current settings can be displayed as plain text that can be copied. side by side and read / write arranged among each other. integrate it as a template in AvrLogger. - NEW: "Color-Scheme" two selectable color scheme integrated. - Apply the settings with "Use Scheme"
- Execution times of "Save-Config" improved. - Performace of config pages (GUI) improved. - Some Timeout function integrated to avoid infinite Loop's. - Upgrade feature removed from versions prior to v1.02.003. - Sometimes AvrLogger could not be stopped properly during a "shutdown". - Fixed a crash when a crontab was expected and none exists. - Fixed a possible error after a cold boot. - Some wait cycles to ensure proper behavior during initialization are removed. - Improved execution time to determine network interfaces and storage pools. - Improved execution time to calculate I/O values from network interfaces and storage pools. execution time, on a Dual-Core DiskStation, by at least 50%. - History Layout changed and added a few new messages. - Fixed a crash when no "md"-device (raid) was found. - The grouping / splitting function can now be set and from when a line break should take place. Ideally, this will reduce the legend to a single line even if a storage device or network interface is selected. - AVR-Logger can now log the I/O values from network interfaces and storage pools. Values are output in MiB/sec (1 MiB = 1024 x 1024 = 1048576 Bytes). - An existing SSD cache and its devices are not considered. - The system storage pool (md0) and the swap storage pool (md1) are disregarded. - Up to 4 selectable storage (array / hdd) devices. Each with write / read values. - Only physical interfaces like eth0 / cvs_bond0 are considered. - Internal network interfaces such as localhost; loopback; Docker as well as WLAN are not considered. - Up to 4 selectable network (eth / bond) devices. Each with write / read values. - The labeling color of each axes can now be set. - Text color of the legend can be set to the axes label color instead of black. - Most of the input fields changed to Selectbox. - The legend will now, if a horizontal orientation is selected, split into network interfaces; storage devices and the rest. - In order to avoid a "divide - by - zero" error with the scaling axes, the difference of Min - Max must be at least 10. - Clipping function integrated for the plot area. - Balanced balance between the profiles. - Each profile has received a derived copy "/2" that generates significantly less data. - Now performs a garbage collection of the configs during an update. - Added a second search path for the CPU temperature. - Improved execution speed of plot creation. - Fixed a bug that could cause a crash on an empty database. - start-stop-status sometimes misdetected hibernation mode and then displayed an incorrect hint. - Simple moving average (SMA) rewritten. The filter depth now has no influence on the execution speed. - OID Error handlig improved. - Integrated the ability to delete the database every time the daemon is started. New: Time for archiving on a daily basis. New: Archiving every time the hibernation is started. - Text for the history, which is output after archiving, corrected. Write now, the correct next time. - Some notes supplemented, corrected. - If a sensor is not available, then instead of "zero", the minimum value of the corresponding axis is used. - Improved performance in parts of the daemon. - For system load, instead of the SNMP "ssCpuIdle", the system values from "/proc/stat" are used. - The day of the week was calculated incorrectly. As a result, the time scheduling has worked offset by one day. state is on or off. - Integrated color picker. Colors can now be selected in a pop-up window. they will be displayed in "Plot-Config" the first time with #FFFFFF and the color must be re-selected. - Note on "Archiving" and "Plot Copy" added that while hibernating, the plots are not archived and not copied. hibernation state in combination with the day of the week. active state in combination with the day of the week. - Added an icon in the navigation bar indicating that AvrLogger is "Active / On" or "Hibernating / Off". Hibernation mode should be disabled before upgrading, otherwise AvrLogger will not start automatically. Due to a problem in the DiskStationManager (DSM), AvrLogger can not be started immediately after an upgrade. The problem can be solved if directly after the upgrade the DSM page is refreshed / reloaded in the browser. In most browsers, this can be done with F5 or Ctrl-R, or open AvrLogger in a new page. - Added switch with which the timing can be reversed. "Off": AvrLogger is stopped in the specified time window. "On": AvrLogger is started in the specified time window. - AvrLogger now supports time scheduled "hibernating" and can be configured in "Avr-Config"
If "time scheduleing" is activated, hibernating will not be interrupted outside of the time window. Please note: Settings are applied "immediately" and hibernating is activated / deactivated accordingly. the timeline and the plot. This only has an influence on "new" values. - In the Plot, timeline settings and grid changed to a multiple of 5min. - Instead of "/etc/crontab" now "/etc/cron.d/crontab" is used. simple moving average (SMA). Higher values filter more peak values. - Accuracy settings "low" and "yawn", in addition to the polling frequency, the number of plot values is reduced. This significantly reduces the CPU load when the plot is updated because there is less data to process. - Update interval in Avr-Config is now a selectbox. The intervals are now selected in minutes. - Cron-Job implemented: Plot update and archiving is now controlled via the "crontab". - Start- / Stop-Scripts adapted to Cron-Job. - Between the query of sensor data, the daemon now sleeps mostly and is then in "idle"-mode. - Occasionally it could happen that a plot-config change was not detected. - Signal handler integrates between the daemon and AvrLogger. - New setting option integrated in Avr-Config. It is now possible to select the accuracy and thus the polling frequency. This can further reduce the CPU load on smaller DS. 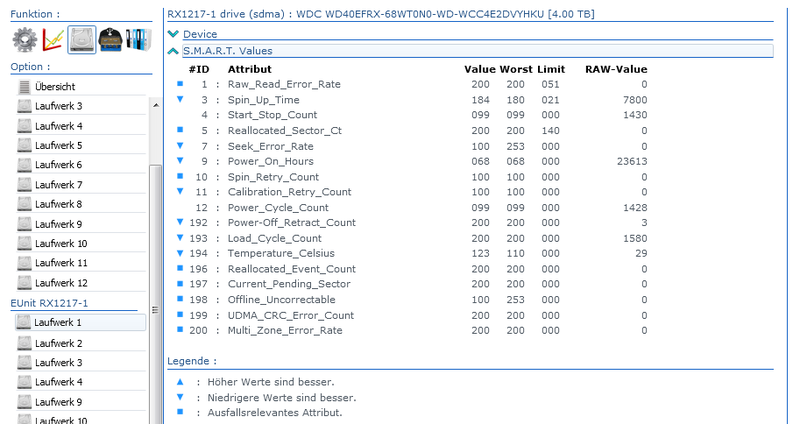 - The HDD averaging was started with an incorrect value and therefore displayed incorrect values in the plot. - An error has resulted in AvrLogger being terminated when changes were made in the plot configuration. - Note added during installation that the specified directory is also archive and backup directory. - A flickering eleminated that occurred the first time the status page appeared. - New button integrated with which the History or LOG can be cleaned. - Optimized "preupgrade" script. Execution time reduced. - Plot creation optimized and performance improved. - In Plot-Options, double colon is removed after the switch label. - No more temporary files are created and needed by AvrLogger. - Screenshots removed from the SPK. set time a copy of the last SVG file created in the archive directory. - The talkativeness of the "History" reduced. - Missing Help Tool-Tips added. - Small changes to the GUI layout. - Added the ability to hide / show the axis label. - Added the possibility to set the font size of the axis labels. - Added the possibility to adjust the transparency of the plot lines. - Some default values for the plot changed. that config and plot were evaluated / processed before they were valid. - Plot will be automatically updated on change. - Help Tool-Tips integrated for the most important settings. - Optimized generated HTML code and corrected formatting. - Occasionally Start / Stop did not work properly. "start-stop-status" rewritten. earlier files are imported and the AvrLogger directory is cleaned up. deinstallation and can be imported during a "new" installation. - The start-stop-scripts have been completely rewritten to suit the new behavior of AvrLogger. - The config files "log.conf" & "svg.conf" are no longer needed. 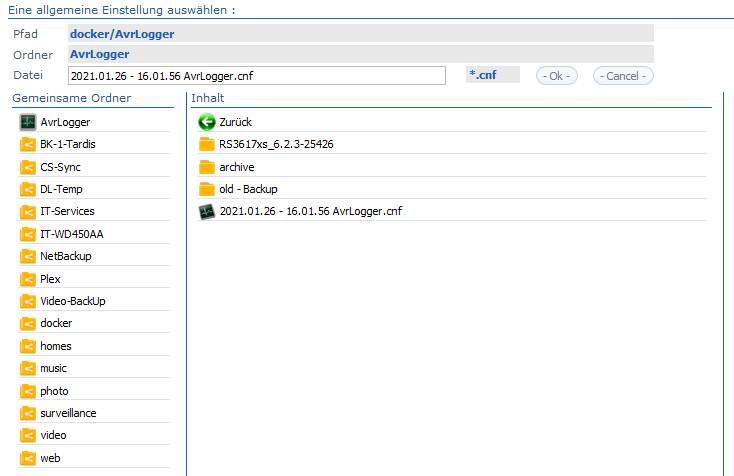 The configuration of AvrLogger is now completely possible in DSM. - GUI Layout made nicer / more uniform. - Structure of the changelog changed. - SPK is now signed. - New: Implemented navigation bar. - Some changes in the start-stop scripts. - New: Login-Check to ensure only logged-in users can access AvrLogger. - New: Check if target directory of "SvgCopy" exists. - An uninitialized variable in init.sh crashed. - The ERROR log file is now backed up during an update. - If "snmpwalk" does not return a valid value, the last valid value is now taken instead of "0". - The "User-Home-Service" is no longer needed. - During installation, AvrLogger asks for a directory in which a folder "AvrLogger" is created to be placed in the file. - When uninstalling AvrLogger asks if the folder "AvrLogger" should be deleted. - Some HDD models have not shipped SMART temperature ratings. - Some cosmetic changes in "messages"
- In some browsers the SVG-Graphics display was not updated in the DSM because of the cache mechanisms. - If only one HDD was installed in the Diskstation, this led to an error in the evaluation. - Due to wrong file permissions the GUI could not be called. - SVG graphics can now be viewed in the DSM. - Initial version of AvrLogger as SPK. Great tool, but the plot is loading slowly. In the version 1.0.2-008 an error has crept in that causes the AvrLogger to exit when changes are made in the plot config. An error-corrected version 1.0.2-009 has been uploaded and only needs to be released.